In my December Ghost Writer article I described off road ‘mountain’ biking in the Fakahatchee State Park and this will serve to acquaint visitors with what they can expect to find either hiking or biking the trails kept open for public use. There were once 200 miles of rail tracks laid within what now comprises the Fakahatchee Strand Preserve State Park which gradually fell into disuse by the late 1950’s when logging ended and the property was sold to developers. The rails and ties were removed although some of the latter can still be seen laying where they were discarded alongside Janes Scenic Drive (JSD). Even the Drive itself was a railroad to which were connected the main arteries and served the interior shorter branch tracks feeding into it from north and south. Ballard Camp, viewed from the north side, is on East Main. 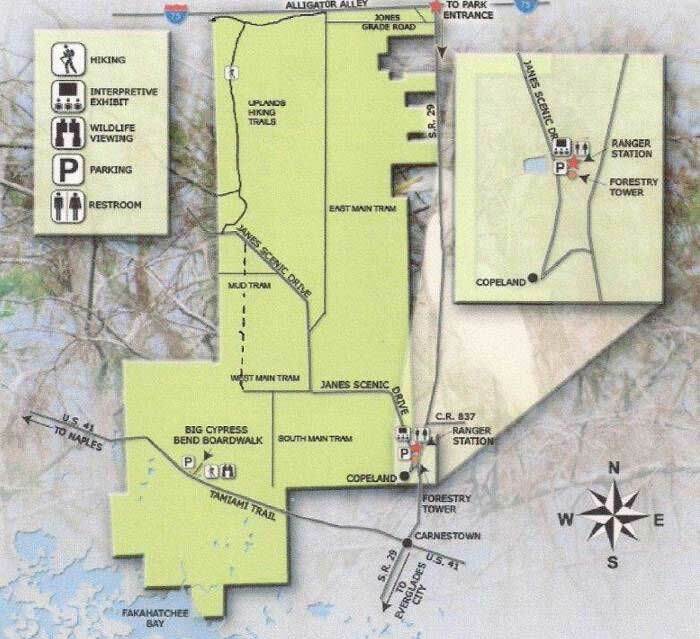 The Developers scammed people into buying small building lots, as happened in the adjoining Picayune State Forest although not on such a large scale, and some remain hidden in the forest today, referred to as ‘in holdings’. 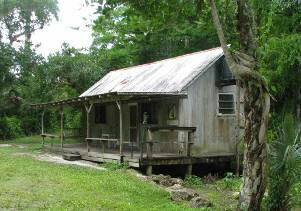 Permanent occupation is not feasible simply because building is not permitted and an in-holder’s camp may simply consist of a bare patch of land partially flooded in summer or an old crumbling shack left over from the 1970’s when the land was acquired by the State of Florida and designated a Park and Preserve – the largest in Florida. Believe it or not, there are still almost 1000 such lots scattered throughout the Park with most hidden away in the depths of the swamp. The 200 miles of trails have almost all disappeared, recovered by Mother Nature, with the Park Staff assisted by the ‘FAKA-hackers’ – volunteers with the “Friends of the Fakahatchee” CSO – just managing to keep open what remains. The annual ‘Ultra Marathon’ is run through much of the Park in February and is preceded by a burst of trail clearance each year, which leaves the remaining trails in their best condition before the tropical summer rains arrive and the vines, creepers, and undergrowth encroach once again to reclaim the remaining signs of civilization. Mentioned below are trails that can be ridden or hiked and, in the case of JSD, driven. This main road bisecting the Park is accessed from State Road 29 at Copeland. The paving ends just past the Park Ranger Station. The JSD continues N.W. for 12 miles until it connects with the back entrance to Picayune State Forest. This is a narrow, bumpy dirt road running through the heart of the Swamp forest, affording access to the main off-road trails. There are several places where you can safely park and hike or bike. Of course, lock your vehicles and stow valuables out of sight. The following trails are all double track with grass between. They meander through tall pristine forest and luxurious understory festooned with ferns and bromeliads. Wildlife encounters of all kinds happen on a regular basis, so keep your camera handy. The gated entrance is three miles from the start of JSD, sign-posted on the left. A double track ends at a small open prairie 3 miles from the trail head. At this point you have two options. The first option is to backtrack to the trail head after a mildly strenuous ride at about 7 mph. The second, more strenuous option continues north across the grassy prairie and connects with Mud Tram trail (see dotted line on the map). Side trails make a compass or GPS mandatory, as the trail is not marked. This is the main hiking trail with ample parking, located on the right approx. 6-1/2 miles from the start. The first 2-1/2 miles are easy double track and bring you to an in-holding known as ‘Ballard Camp.’ This privately-owned corrugated iron cabin was once a logging supervisor’s cabin and is kept in good shape by its owners. They kindly allow visitors to rest on the front porch, but please respect their privacy if they are present – accompanied by a vehicle parked nearby. They maintain a jetty running from the back of the cabin to a lake which is always busy with alligators large and small. Bear right past the cabin and the trail continues for another half mile before being blocked; other than in February-March when it is cleared for the Marathon. The trees here are heavily festooned with bromeliads. The gate with limited parking is presently un-signposted and is located on the left a mile past the East Main entrance. As the name implies, it becomes very muddy in summer. The double track ends after three miles when you break out of the tree cover into the open at the Picayune State Forest line. Tony Marx is a Florida Master Naturalist and FOF Board Member. He is also a volunteer interpreter for the Fakahatchee guided tram tours and frequently contributes articles to The Ghost Writer.